I’m finally crawling out of the deep abyss of sleep deprivation and showering once every few days. I wish that showering part was a joke, but it’s not. I’ve been consistently training at least four days per week and am going to add a fifth day soon. Things are a little tricky right now because Emma’s limit is about an hour in the BOB, which means I can just about get in 8 miles on weekdays. 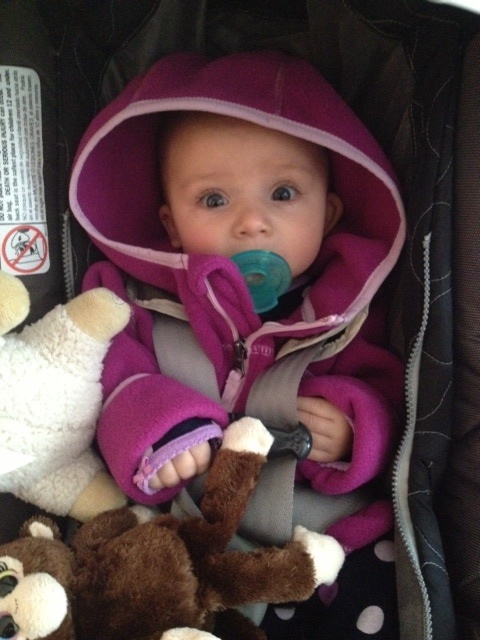 I’d like to be able to do at least one longer run during the week, and I’m hoping once we switch to having her sit upright (facing out) versus in the infant carseat adapter she’ll be able to see more and want to stay in the stroller longer. We’re going to try an easy run on Saturday and see how she likes it. From our run yesterday… I’m going to miss being able to look at this face while I run. First solid foods: rice cereal, oatmeal, fruits, and veggies! Sleep… She’s been sleeping until 8 instead of 5:30 which feels fantastic. Trying to stay off social media and live in the moment… most of the time. What are you training for this spring? Any thoughts on social media overload? Great post! I can’t wait for Boston, sister 🙂 Also, I wish social media never existed. It seems like another thing on my to-do list for me. Are you doing the VIFL 14k? I’m coming back next month for that one actually. My ultimate goal is to be training for the NJ half so we shall see how that goes. I’m glad to see your training is going well. I applaud you in staying off social media…I try and it never works. ha. I’m not sure! I did it a few years ago and liked it. I’ll have to see how training goes these next few weeks. I’m not taking a total break, just trying to not be that person that’s always on their phone. I saw that viral video and it totally resonated with me. I understand that completely (in both cases). I try and log off of all social media between 8-9 every night.